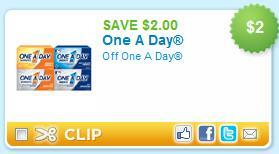 Coupons just released a new coupon good for $2 off One A Day with no size restrictions. Click here and if needed use the zip code 55555 and click the “Healthcare” category to find it faster. Most Targets have the One A Day Women’s Multivitamin 10 ct priced for $1.99 in their travel section, so free after coupon. I’m anxious to try the women’s multivitamin.